Burnham Market01485 532610work VillageLargest of the Burnham villages, Burnham Market has grown from the merger of the three of the original Burnham villages, Burnham Sutton, Burnham Ulph and Burnham Westgate. 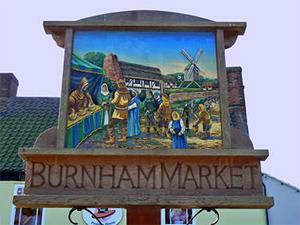 Just over a mile from the glorious coast, Burnham Market is close to the mouth of the River Burn and the name Burnham probably derives from this. With its open green surrounded by characterful flint cottage, this charming village is extremely popular with holiday makers and as well as second home owners and is sometimes attributed the name ‘Chelsea-on-sea’. The village provides a great mix of renowned restaurants, pubs including the Hoste Arms and The Nelson and a special mix of local shops including a traditional post office, butcher, hardware shop, fish shop and around 30 highly original independent and specialist shops, deli’s, beauty salons, and galleries selling paintings, prints and unique coastal artworks. Largest of the Burnham villages, Burnham Market has grown from the merger of the three of the original Burnham villages, Burnham Sutton, Burnham Ulph and Burnham Westgate. Whether you’re staying over or just visiting for a few hours, this is a lovely village to spend time relaxing, browsing around the shops and soaking up the atmosphere of a beautiful and bustling village.